A diagonal brace, domineering two sides of the cube, was made for a reason and so it became a dominating element of a building structure. It is because the kindergarten, consisting of basement+ground floor+one floor, should be located near the existing building, consisting of more floors (ground floor+4 floors). In that situation, a building should be able to be marked as an equal on that particular place. That is achieved through the diagonal that supports a ruptured roof plane, and altogether corresponds to a domineering oblique roof on an existing residential building. This way, displayed after the construction, the expected illusion of greatness of the designed building is achieved. Beside that effect, a diagonal brace and ruptured roof plane annul the perspective diminishing on the both sides of the building, that are perceived from main communication, so it is experienced as it is significantly bigger. Birds’ houses location at the roof part, showed as an effective one in a sense of directing a view upward, also having a positive effect on dynamic effect of the whole composition (in our opinion). Orientation of care for children, located on both floors, demanded a serious sun protection and creating conditions for daily children’s rest. Also, it was necessary to solve the problem of the noise, considering the vicinity of a communication. For the ground floor, segmental roll protectors from the light and sun are predicted; and for the first floor, the vertical rotating brise-soleis are chosen. Combination of rolling shutters and brise-soleils are practically infinite, and that is the thing which gives us a „cheery facade“, the effect that brings colors to the white facade. Composing of all of these elements was done in order to create the atmosphere of a place attractive to children. The Bijelo Polje Kindergarten building is set on a humble location in a narrow urban core. That is the reason for designing floors for it. The functional scheme is simple, with dwelling spaces on the edge of a common dining room and game room. A game room on a ground floor has got its own expanding towards the yard, what is achieved by using sliding windows. The rooms for administration are leaning to the game rooms for children, intentionally, with glass partitions. 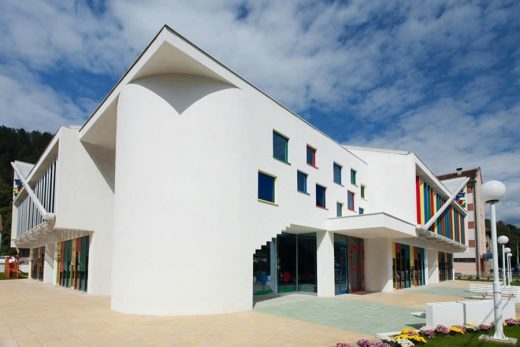 There are set all of the economically important rooms for this kindergarten building. Economical entrance is put through on a back side, servicing by a side street. Associates: Imer Franca, A.E., Elvira Muzurović, M. Sc. A.E.